Considering the number of times that I've been to this restaurant, you probably expect that I've tried every single item on their menu by now. "So why is that not the case? ", you may ask. And that's because every day, the menu changes. Hence the name Confusion Plant-Based Kitchen. 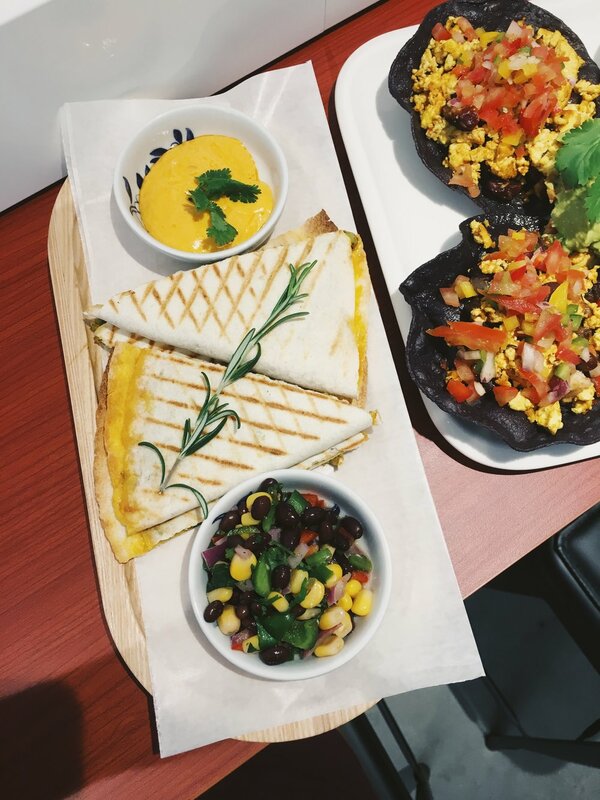 Price: Tacos, quesadillas and wraps are priced at no higher than $80 - very reasonable when considering the portion and comparing it to many other vegan restaurants in Hong Kong - whereas the Beyond Burger is $145 (it is common for the Beyond Burger to be priced much higher than the other dishes offered). The portions often come in twos or threes (as seen above), so they're mostly great for sharing, too! Excellent deals for the food you're getting. Environment: The overall environment of the restaurant varies largely with the time you go. At 6pm, it will be completely empty. 30 minutes later, it will be packed with all types of people. I personally prefer it when there are less people, because the lack of space in the restaurant means that when it gets crowded, you may have to share a table with other customers, the waiters can't respond quickly to your raised hand, and everything gets a little hectic. The result is also not a lot of walking space, and you might end up tripping over other people's stools or even their feet! Food: From Mexican food such as tacos and quesadillas, to Greek food such as falafel wraps and platters, to Japanese food such as soba noodles and yams, to Western food such as burgers and fries, to my favorite desserts such as chocolate crepes and lava caves, Confusion has it all. Additionally, most of their sauces are homemade with secret recipes, and I've never tasted a sauce that didn't pair perfectly with my dish. Location: Although slightly isolated from the main road, Confusion Plant-Based Kitchen is not too far from the Sheung Wan MTR exit A2. This short walk is what makes it a hidden GEM and thankfully (at least for some customers), prevents it from being overcrowded.